They say good luck is what happens when preparation meets opportunity. In other words, luck isn’t so much a happy accident as it is a reward for doing things the right way, at the right time. Amazing service isn’t “magic.” It’s a result of hard work and experience. At Mellady Direct Marketing, we strive to bring that philosophy to every project we complete for a client, whether it’s printing and mailing a marketing mailer, or conducting a social media promotion, or running a comprehensive marketing campaign that incorporates all the best of online and print direct marketing services. Each client’s needs are unique: Some of our clients are marketing agencies that use Mellady Direct as their go-to vendor for printing and direct mail services. Others are businesses that rely on us for everything from helping maintain their social media to providing comprehensive marketing services, including strategic development, branding, copy, design, digital marketing, printing and mailing. In each case, our team brings a high level of caring to provide amazing service — and it doesn’t just “happen.” Just as luck is what happens when preparation meets opportunity, great service is what happens when a client’s needs are met by our combination of experience and hard work. And, that high level of caring. The whole point is to make it easy for the client. If we do our job right, the client may very well think we have a magic wand or some trick up our sleeve – when in reality, the only “trick” is to understand what it takes to provide amazing customer service. There’s no potion or spell for that. Just experience mixed with good old-fashioned hard work and values. 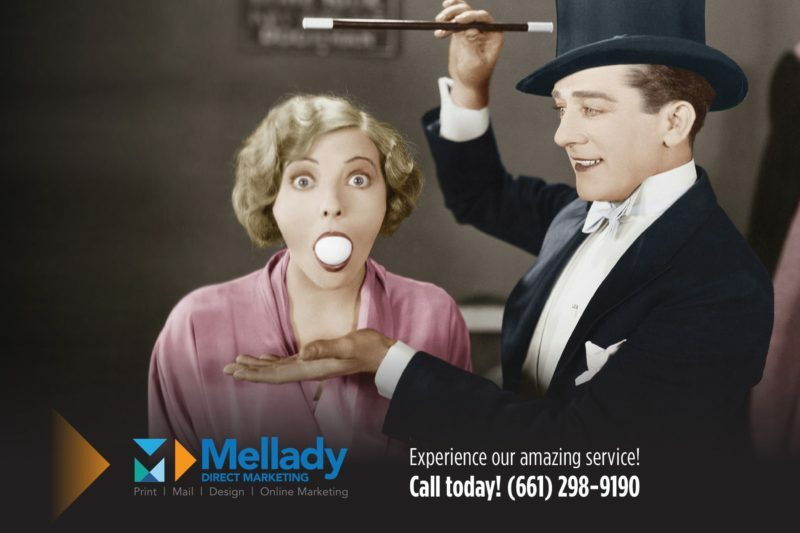 Mellady Direct Marketing can make it easy for you to deliver effective direct marketing! Call us today at (661) 298-9190 to experience amazing service!